Are Community Managers the Silver Bullet to Your Engagement Problem? Is a Community Manager the Silver Bullet to Your Engagement Problem? Jamie Russo on the value of community managers and how corporations can capture some of their magic. Image courtesy of Enerspace Coworking. The genesis of the coworking movement was community building — creating an environment in which people share ideas, skills, knowledge, resources, develop relationships, and become better together than they could be alone at home at the kitchen table. The early coworking movement, which began around 2006, was really not about space, it was about the value of togetherness. This year, the movement celebrates its 10-year anniversary, and while a lot of things have changed and have been improved upon (design knowledge, technology offerings, the sheer proliferation of spaces around the globe), community managers remain central to the value proposition. In this article, Jamie Russo, the founder of Enerspace Coworking and the president of the Global Workspace Association, discusses how community managers integral value to coworking spaces and how corporations could capture some of the magic in coworking-like spaces of their own. What is a community manager in the coworking context? A small coworking space (let’s say one under 10,000 square feet) is generally run by a community manager who also acts an operations manager, sales lead, event coordinator, and often times, barista (the coffee is very important). In a larger space, an operations manager and an event manager typically support the community manager. The community manager is always the central role, because — as they say in the biz — coworkers “come for the space and stay for the people”. This theory is supported by the qualitative experiences of many community-centered coworking space owners, employees, and members and has been written about extensively by those studying the industry such as in this article, “If Work is Digital, Why Do People Still Go to the Office?”, and “Why People Thrive in Coworking Spaces”. When the community manager is successful, she drives engagement and helps people to thrive. Knows each member well — what they do for work, how many kids they have, what neighborhood they live in, whether they are a foodie, have pets, or play in a band on the weekend. Takes all of her knowledge about the membership and connects the dots. There are two members that don’t generally run into each other but both have Goldendoodles? Email intro. Another member is looking for a WordPress developer and there are three members that fit the bill? Personal introduction. Some people join coworking spaces not because they want extensive interaction, but because they want more interaction than waving to their mailman. Their coworking membership gives them a reason to get out of bed and put an outfit. And the community manager is the welcoming smile in the morning — the one that notices if you haven’t been by in a while. She makes small talk, she asks about your business. She cares. We are social creatures and sometimes that’s all we need. While informal connections can be the strongest and most authentic, we like to get the party started by, well, throwing parties. Happy hours, potlucks, accountability groups, show-and-tell days, etc. Knows when to facilitate and when to disappear. She has magical powers but ideally she’s trying to teach the members how to fish — to develop their own relationships, to establish their own social norms within the space, to schedule happy hour, to organize a breakfast, to initiate a social media lunch and learn. Behind the scenes, the community manager, especially in absence of the operations manager, does all of the things that make the space hum — orders supplies, makes sure there’s always coffee, manages meeting room schedules, sorts mail, is the go-to if there’s an Internet or printer issue, gives out lunch recommendations, reminds people when it’s Food Truck Wednesday, updates the website, sends the newsletters, calls the plumber when there’s a leak in the bathroom, orders food and drinks for happy hour. Studies show that people are happier when they are coworking. That happiness seems to be derived primarily from the community that is developed in the coworking space. And the community is largely the work of a talented community manager. On the other side of the work fence, are the folks that work for corporations, who (I assume) are not yet coworking out in the wild and who are undeniably disengaged. Steelcase conducted a study on employee engagement with almost 13,000 respondents from 17 countries. The results showed that almost one-third of the workers in 17 of the world’s most important economies are disengaged. Only 13 percent are highly engaged. One of the survey’s key findings was that highly engaged workers are also highly satisfied with their workplace. This correlation points to an opportunity: improve workplace satisfaction and drive up engagement. 97 percent of highly engaged workers feel connection with their colleagues, while only 43 percent of highly disengaged workers feel the same way. 95 percent of highly engaged workers value company culture, while only 17 percent of highly disengaged workers do. 98 percent of highly engaged workers feel a sense of belonging to the company while only 16 percent of highly disengaged workers do. One could argue based on this data that a flexible work arrangement with a focus on engaging workers with colleagues, developing company culture, providing opportunities to socialize, and all the while helping workers feel a sense of belonging could drastically move the needle on engagement. Killeen’s description of a third place is also a great description of a coworking space. Today, the leadership at many organizations is creating policies to meet the needs of a new generation of workforce that places high value on mobility and the third place. But the company, in many cases — Yahoo is a well-covered example — would prefer that the employee come to the office. If corporations are moving toward flexible policies, then they will concurrently be flexing their marketing muscles to figure out how to compel employees to choose the corporate office at least some of the time. One way to do that is to create environments that have attributes of the third places that we seek when we have full choice over our work place including flexibility, beautiful design, amazing coffee, retail-like tech support, and of course, community. 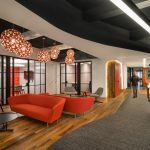 We are starting to see examples of corporate offices emulating coworking spaces: CBRE, Credit Suisse, Coca-Cola, Target, and Kraft Foods come to mind. My favorite example on this list is Kraft Foods. Their sea of cubicles and dreary meeting rooms sucked the soul out of me in my role as brand manager, post-business school. The stark contrast between that environment and the startups I was a part of before and after my time at Kraft played a major role in my passion for coworking. In 2014, Kraft made an epic design change. Take, for example, the former Kraft board room that was converted to a new “Engagement Center”: an employee hang-out area and after-hours event space. The Engagement Center is connected to an “IQ” bar, a tech support center modeled after Apple’s Genius Bar. The Kraft engagement room. Image courtesy of Crain’s Chicago Business. Photo by Steve Tsai, courtesy of figure3. What I think is interesting about these examples is that there’s a clear connection to the factors that drive engagement in the language used to describe the spaces, but no mention of an actual human to facilitate the experience in the space. I wonder why the community manager role is so pervasive in the consumerized version of a workspace — the coworking space — but the role doesn’t seem to appear in the corporate versions. One company that has converted most of its company offices to the corporate “coworking” format notes that they see the value in the community manager role, but that the current structure has the business units in charge of the floors with the workplace strategist monitoring things like usage/occupancy, protocols, and change management. If engagement drives productivity and productivity drives profits, I wonder why corporate coworking spaces don’t hit a home run on the engagement front by hiring a community manager? Delivering engaging physical space but no human element to facilitate, to connect to give it life, is like a Starbucks with no baristas, or a tour bus with no tour guide. You can make it work, but the experience will be sub-par. So what would this community manager do in a corporate environment? This role might report into HR but it is not a traditional HR role. Ideally, this person would not have administrative HR duties but would be solely focused on driving employee engagement through the activities outlined above: helping people learn how to use the space to fit their needs, connecting with colleagues, aligning with company culture, creating opportunities to socialize, and fostering a sense of belonging. People may need to learn how to use their new, flexible environment. Having a space expert roving to make sure people are comfortable with the environment, that they know how to use the technology, and can identify the perfect space based their work, can go a long way to make people logistically successful in the space (think change management). The community manager knows no department boundaries but she does know everyone that uses the space. She asks questions, she listens, and she connects people. Just as in a coworking space where she may connect designers and developers or gardening enthusiasts, she may make connections through her birds-eye view that those in the forest would never make. The community manager becomes a key delivery mechanism for the company culture desired by the very companies that create corporate coworking spaces: innovation, engagement, purpose. She is like the company newsletter personified. She shares innovation news, she facilitates engagement, and she makes personal connections that help employees see meaning in their role. This Harvard Business Review article suggests that that one reason that people thrive in coworking spaces is that people feel more interesting when they get to tell others what they’re working on. In a coworking space, you often encounter new people that ask you about your work. This can also be the case in a corporate coworking space and the community manager can help to facilitate those introductions among colleagues. The community manager will grow to know the micro-culture of groups within the organization, which is different from that of the corporate culture. She will identify and organize relevant social opportunities — whether it’s happy hour, a learning opportunity or a running club. According to another HBR article, highly engaged organizations have double the rate of success of organizations with lower engagement. So: would you consider doubling your odds and hiring a community manager?